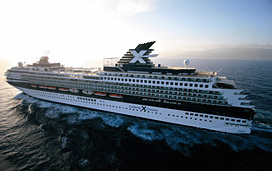 (4:45 p.m. EST) -- Celebrity Century will sail its final season with Celebrity Cruises in April 2015, the line confirmed today. The divestiture of the ship has been a badly kept secret for several months, ever since French-operated sister company Croisieres de France announced it will be taking possession of the ship in 2015. Celebrity declined to comment on whether Century would go to Croisieres de France, saying "future plans beyond that will be announced at a later date." From March 2014 through April 2015, Celebrity Century will visit 77 ports in 32 countries, the most destinations of any ship in the Celebrity fleet. The line will celebrate this final season with several special events, including a 14-night President's Cruise to Asia with Celebrity President and CEO Michael Bayley. Celebrity Century launched in 1995 and was the first ship in the line's fleet to feature the specialty restaurant Murano. It is the oldest ship in the fleet.